There have been rumors that Gov. 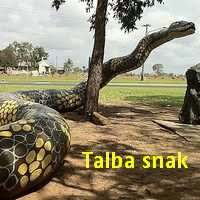 Aliyu Babangida, Talba of Niger state Nigeria owns this big snake in his farm that he bought it from India for some huge amount milloins, they are even said to be two and one escaped and they only feed on cows not goats cos goats are too little for breakfast, its one of the biggest snake I've ever seen. But come ohh i cant even imaging a polictician who should be taking care of the poor, spend such a huge amounts to buy snakes and also a good number of people are out there that just need a piece of meat but here is a snake eating a complete cow. what a world. comments and contributions are welcome, because this information was just something i heard and i will love the world to tell me how true is it. Is true ohhhhhhhhh, the news was everywhere one certain time.